While Thien is still on suspended leave, thinking of all the wrong he has done, The Comix Claptrap welcomes cartoonist and screenprinting master, Dan Zettwoch as our special guest co-host! In this episode, Dan and Rina get to interview inspiring and funny cartoonist and painter Carol Tyler! 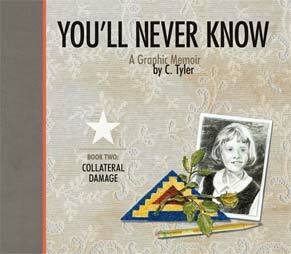 We talk about the latest volume of her graphic novel series You'll Never Know, Book Two: Collateral Damage and the research and preparation involved in sharing a deeply honest portrait of her family and her father's experience during World War II. We also talk about our time at the 2010 Alternative Press Expo and new comics from the con with good buddie, Josh Frankel. A lot of good, positive stuff in this one before Thien comes back in full force -- so don't miss it!